I have always loved walking. I lived in Paris for about two years (1989-1991), and I didn’t get a car. 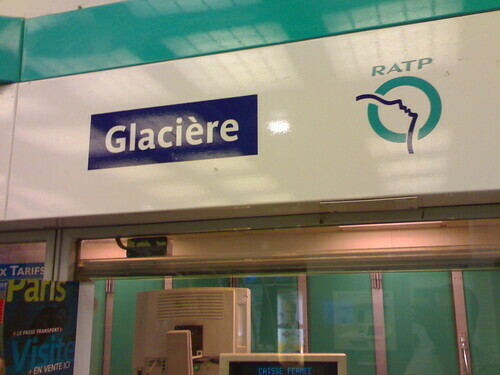 I loved using the metro, my metro station was Glacière (photo taken by me on a much more recent visit to paris). When your primary means of transportation is the métro, you have to walk, a lot. I got used to walking that I would sometimes just walk to my destination even if it took an hour or more, the city makes walking enjoyable: through streets full of shops, gardens, parks,fountains, old buildings, statues, and so much to see… Walking there is full of culture, romance, and green spaces. In late 2010, with the much better weather, I tried walking in Doha and it was a disaster. The sidewalk is sometimes non-existent, too narrow, or has cars parked on it. The pavement is full of holes, and cars driving by usually ignore any pedestrians. I had a similar parisian experience when I was on the job training in Paris for almost an year in 2004. I stayed in rue didot for 4 month and had to take the metro daily from Alesia And exchange at Denfert-Rochereau to take the RER B to and back from work. The commute time was almost an hour with no less than 4 km of walk. At first it wasn’t pleasant , but then gradually I started liking the experience, despite the gloomy raining autumn days, as it gave me time to read. I never read that much books like that year I lived in Paris. Then I moved chatlate where I used to catch the RER B directly from les halles with just 25 min commute time, still I had to walk for almost 3 km daily. I too miss walking in Doha. I could spend many hours walking the streest of Rome, London, Budapest or Barcelona and just by chance find something interesting. I always feel I don’t get enough exercise in Doha. Hopefully it will change for the better in future.